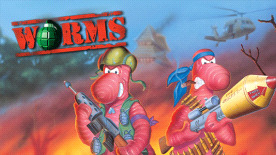 Throw a grenade down memory lane with the original and classic turn-based strategy game Worms™! Up to 4 teams of worms do battle over an ever-changing battlefield with falling weapon crates, crazed exploding sheep and more besides. Winner of many industry awards, find out what all the fuss was about. Experience for yourself where it all started on the PC. Worms™ requires great thought, strategy and elements of sheer outrageous fortune. Not only that, but with an almost infinite range of playing possibilities, no two games are ever the same! Worms™ is the ideal way for friends to enjoy a few hours. Configure the game through its myriad of options and tailor the whole style of play. It's a game you can pick up with a few spare minutes or play an entire weekend! It's Worms™ - you'll love it! Think of a landscape… any landscape. Grab some platoons of little pink worms and liberally scatter. Give them weaponry, tools and an eye for their enemy. The aim is to ensure that you are the last team standing. Take no prisoners! See where your favorite weapons and utilities were first unveiled and play your way through an extensive single-player campaign.